I MUST be crackers leaving the lovely hot sunshine to come back to this! At least a decent tale to come back to—Cart selling off its marinas! No doubt needed to pay off the massive loan of £100 millions it foolishly took out to cover its runaway spending. But to tell prospective buyers it is selling them to raise money to invest in something else is also crackers—hardly a good advertisement for someone to buy the marinas as an investment if it is not good enough for Cart! Problem is there are not really any business people at Cart, or if there are, they are most obviously not listened to, if statements like that are allowed to be published. A good example of poor business acumen is our own BWML Sawley Marina that was much better run when it was in private hands—and of course business people—who saw that the interests of the boaters were paramount. 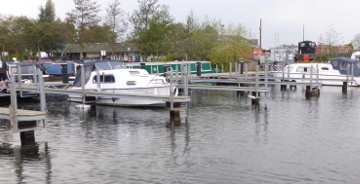 As an instance, the marina being on a river meant that 'plastic' boats are prevalent, with many owners wanting to have their boats out of the water during the winter to better preserve the hulls, In those days a crane was on hand to lift them out onto the 'hard', enabling owners to undertake anything necessary, then lifted back after the winter. But BWML saw that 'hard' as wasted space so installed electrics and water and turned in into a caravan park. That alas was a bad decision as it was very seasonal, and mostly nearly empty. so that was stopped and then leased to a caravan supplier, as it is today. For boaters, us included, one of its worst decisions was taking away the DIY facility, whereby a boat would be pulled out of the water on a Friday and left over the week-end with electric and washer provided so that boats could be blacked by the owners, after which they would be returned to the water on the Monday morning. We used the facility a number of times as did many other boaters. In those early days a number of boaters, us included, took the advantage of fitting out sailaways, not only being given a spot with nearby parking for the purpose but being able to get everything needed from the chandlery. But under BWML it can hardly be called such anymore, as such equipment is no longer available, in fact it is more of a shop. Mind you, with around 100 resident boats, that is handy for them, except for Tuesdays' of course when it is closed—another strange decision. One of the most expensive decisions was to cram the marina full of extra jetties to provide over a hundred more berths, but alas, at the same time British Waterways was well into persuading all and sundry to build new marinas to accommodate the burgeoning interest in boating, with these—such as Barton and Mercia marinas coming on line. This extra berths at Sawley included Platinum Moorings, meaning the boater would get his boat washed, groceries delivered and other such things, but at twice the normal mooring rate. Of course no boater was daft enough to take it up, so eventually the berths were offered to residents. But many of the berths still stand empty. Then the bubble burst with most of the industry’s boat builders going out of business. But worst was to come as with the opening of Mercia Marina, above those six difficult broad locks on the Trent & Mersey Canal. there was a mass exodus from Sawley. The result was that at the last official count Sawley was only two thirds full, with many of those new berths never having seen a boat. And still a further problem for boaters, cramming in all those extra jetties meant there are only so many berths that can take a full length narrowboat, as there is not enough space left for them to manœuvre. But it is not only Sawley, as last year it was stated that the average take-up of berths at BWML was around two thirds. So perhaps for boaters at least, selling them back to private hands will be a good decision. Has any boater seen any of those 1,205,479 visitors a day that Cart would have us believe visit the waterways? More like one dozen! Which means to make up the missing number the hell of a lot more per day must visit the waterways in summer! Still more unbelievable statistics for you to digest, with Cart now insisting to would-be developers that building by a canal will increase the value of their houses from 15 to 20%! No way José. I know of developers who have faced their houses away from the canal, especially if littered with moored boats, their noise and their debris. Though I totally agree with Richard Attwood who tells us that the way to stop cyclists speeding along towpaths is to have speed bumps at regular intervals, it will not happen. I realise this is not a waterways subject but I have a photograph that may be of interest to some of you railway buffs—it was sheer panic on the country's railways when snow was forecast, with even cancellations before a single flake had fallen, and then the few inches just about closed down the whole system. People in such as Norway were using Twitter to ridicule the 'Beast from the East' as we named it though it had passed through those countries beforehand, and worse, and certainly not been given a fancy name. How different from us, where snow is expected and dealt with and the trains still run even with feet of snow. 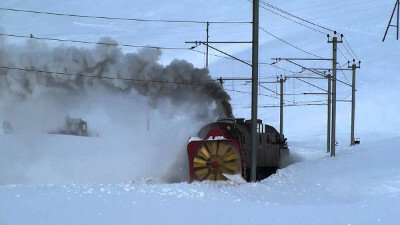 I am referring now of course to Switzerland, where though the whole system is electrified they had the sense to keep half a dozen steam trains fitted with snow clearing equipment to clear the lines with the passenger and freight trains following in its wake. Here's a picture. That is real snow! I see the proposed 'masterplan' to build 137 houses by the Trent & Mersey Canal at Middlewich now includes a 12 berths marina! But for a measly 12 boats. And seeing the plans they will have to be very short boats indeed. But anyway, it impressed the council!